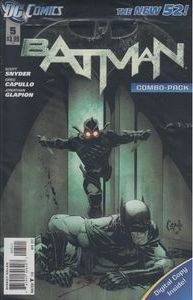 Deep beneath Gotham City lies the Court of Owls' deadliest trap - and Batman has fallen right into it! Can he escape, or will he perish in a maze of nightmare? Enter the labyrinth, Batman - if you dare! This issue is also offered as a special combo pack edition, polybagged with a redemption code for a digital download of the issue.